Its the 75th anniversary of Dr. Seuss' book The 500 Hats of Bartholomew Cubbins and to celebrate this momentous occasion the Art of Dr. Seuss Collection is releasing a limited edition print of Bartholomew Cubbins and his many hats. "Set in feudal times, the story begins in the Kingdom of Didd, when King Derwin is riding through a street past Bartholomew Cubbins, a poor boy in the market. Bartholomew removes his hat, according to the laws, but another hat mysteriously appears; when he attempts to remove this one too, another one appears again, and this continues, even as he removes more and more hats, each growing in extravagance and beauty from the 451st hat onwards. Ted "Dr. Seuss" Geisel was insired sitting behind a business man wearing a hat, while riding a commutor train from New York to New England. Dr. Seuss was also collector of many hats and an exhibition of his hat collection will be touring the United States. Read more about his hat collection here: New York Times article . 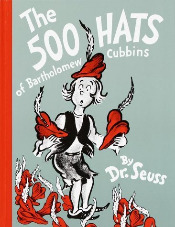 The 500 Hats of Dr. Seuss and Bartholomew Cubbins, All Images TM & © 2013 Dr. Seuss Enterprises, L.P. All Rights Reserved. Call us today to place your order for The 500 Hats of Bartholomew Cubbins - 75th Anniversary Print.